Track: Gruntilda&#39;s Lair | Game: Banjo-Kazooie | Composer: Grant Kirkhope. Track: Gruntilda's Lair | Game: Banjo-Kazooie | Composer: Grant Kirkhope. Ahh Rareware, how I miss thee... once hailed as one of the best developers from their generation, but alas, nowadays you're just an empty shell of your former self. 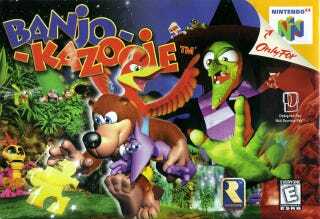 Banjo-Kazooie may be the best game Rare ever created (along with the DKC series). This song is extracted from the moment you step into Grunty's Lair. This song exemplifies Grant Kirkhope at his best, dynamic, goofy and overall a masterpiece from the Scotsman.